WordFind challenges students to see how many words they can find in a group of mixed-up letters, including a word from a list that uses all the letters. What? In order for students to learn and keep spelling patterns in long-term memory to further reading and writing development, they need to use words in different ways. When students have an opportunity to recognize and manipulate spelling patterns, they can use this knowledge to learn new, unfamiliar words. When? Once students are explicitly taught a spelling pattern, they should have the opportunity to play with the words in ways that will help them recognize it and other spelling patterns in other words. This will help students see the relationship between the spelling of the word and other words that form in similar ways. The more patterns students know, the more words they can make by changing the order of the letters in a word to create a new word. Letting students unscramble words helps them recall spelling patterns and construct meaning. If students get stuck, they can ask for a hint, which comes in the form of either a definition or a contextually rich sentence, minus the word. Once students have found enough words to advance, they can move forward to the next word. High scores are saved so students can compete with one another. However, they can continue finding more words to boost their score. 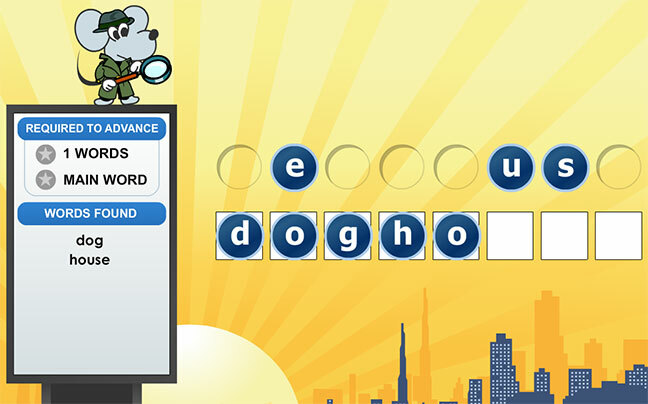 Teaching Tip: WordFind is a fun way to study spelling and vocabulary words while using critical thinking skills to create new words with the letters provided. The more words students find, and the faster they find them, the higher their score will be! Students enjoy seeing their rank on the high score table!